We made the drive up to Milwaukee yesterday morning and arrived at Miller Park about an hour before game time. Their tailgaters were impressive, but the ballpark was so doggone good looking I didn’t have it in me to stop and join the fans. I had to get inside and circumvent the concourses. As I circled, I kept slowly acquiring items: a Brewers cap (with the old glove logo, obviously), a bloody mary (complete with a beef jerky straw), a Miller Lite (why would I get anything else given the circumstances? ), and a “Brat of the Month” – a cheddar brat so juicy it exploded all over the place when I bit into it. After killing nearly an entire hour circling the park, we made it to our seats in the front row behind the RF bullpen. I chose these specific seats because of the impressive view of the retractable roof (see above). It’s super unique and a brilliant design. The roof closes in a quarter circle from both directions. Yesterday the left-field side of the roof was wide open, while the right-field portion was partially closed to keep the majority of the playing field in the shade. It was a comfortable cool afternoon inside the park, and I imagine the fans are extremely thankful in the cold of April and heat of August. The roof and concourse walls are painted a shade of green that can only be referred to as “Fenway Green” – a color that I’ve determined ought to be the official color of baseball. It’s classic and fresh and old-timey. 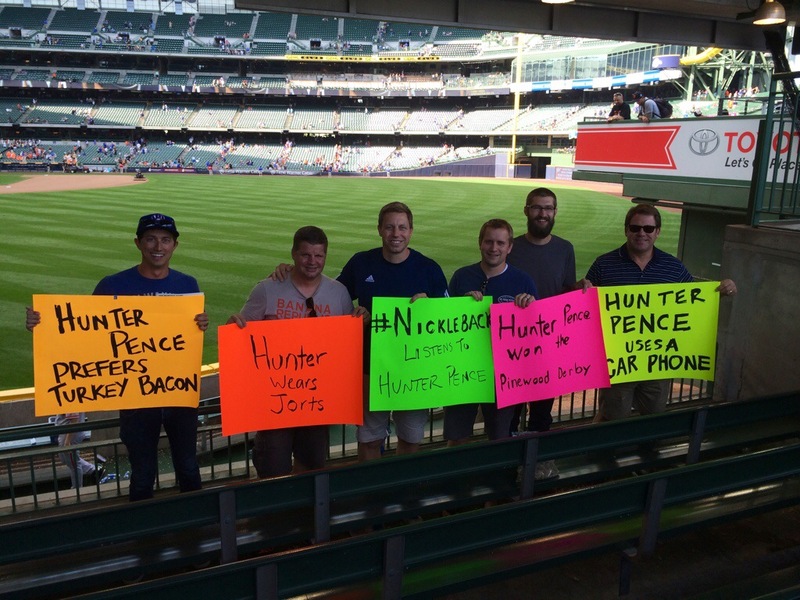 Our seats also provided the perfect location for our #HunterPenceSigns as he was playing right field for the visiting San Francisco Giants. If you haven’t seen the sign trolling that has been taking place over the past week, you are in for a Twitter treat. Just give it a quick search. It was funny to watch the bullpen guys try to subtly read our signs without reacting in any way. They’d turn their heads around and act like they were watching one of the TVs in the concourse while stealing glances out the corner of their eye. It’s always a blast to see those guys warm up so close too. We watched Guttierez, Machi and Romo throw from point blank. So fast. This is one of the greatest graphic design moves in the history of the game. It’s a glove, obviously, with a baseball in the middle of it. But look closer…do you see the M and the B? 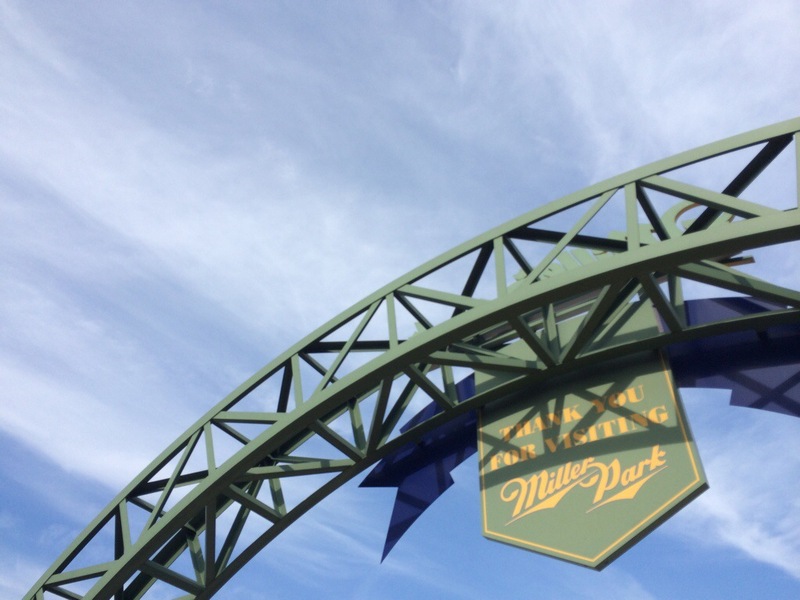 M-B…Milwaukee Brewers….get it?! I freaked out the day I saw that. 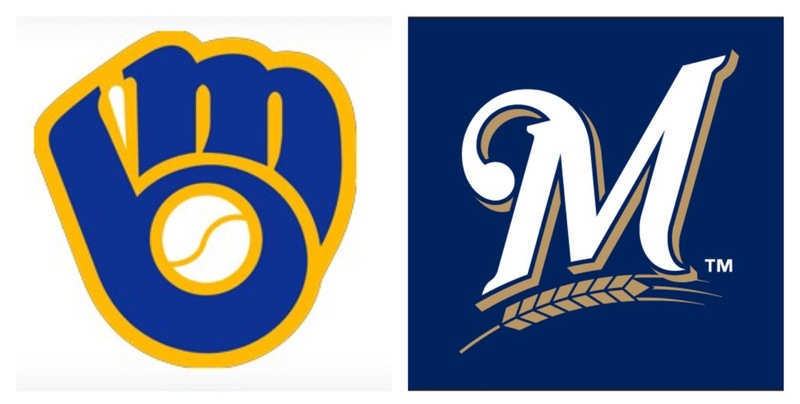 Here are some more clever subtleties in team logos. Team logos are a smaller representation of a larger entity. And when any of us – player or fan – puts on a team cap or slaps a logo bumper sticker on their car, suddenly our actions are representative of that organization. When ballplayers don their uniforms, they are signing up to represent what that logo stands for. If it’s Yankee pinstripes, then they’re going to have to shave and get a haircut because that’s the image the Yankees want to have of themselves. Going beyond the sports example: when people look at each of us, what do they see us representing? What am I “about”? When I step out the door each day, do my words and actions represent the life I’ve signed up to lead? Or, to quote 2 Corinthians 2:15, do I have the “aroma of Christ” about me? This is why I wear a home team cap everywhere I go. As a fan of the home team, I want to clearly represent each one by looking the part. (Although, as a Cardinals fan in disguise, I was a bit conflicted yesterday. I would not have minded if Milwaukee lost the game to give St. Louis an opportunity to catch up to them in the standings. Instead, both teams won, and the Redbirds remain a game back in the NL Central.) But was there to experience life as a Brewers fan. I need to look and act the part. I believe that every interaction we have with others has either a positive or negative impact. You could call it our relational carbon footprint. Everywhere I go, I leave behind me a wake. And since I’ve signed up to follow Jesus Christ, I hope and pray that my wake would be the same as his would be. It’s not. I’ll settle for it being anywhere close at this point. The other connection I want to mention between team logos and Christianity involves the symbol of the cross. Why does the church celebrate the symbol of the cross so much? Yesterday I mentioned briefly that I believe Western culture is more interested in getting to Heaven than we are adopting an altered lifestyle, and I think these thoughts are connected. We have emphasized Christ’s death, suffering and payment for sins so that we might be saved from those things. But the pinnacle of the Jesus narrative is not the Cross. It is the Resurrection. Why do we wear cross necklaces and image Jesus on the cross so much in our churches? Why has the “team logo” of Christianity been the cross? The Church “logo” should be resurrection. The empty tomb. The future restoration of all things. The never ending, never surrendering, never giving up on us love of God. The resurrection. 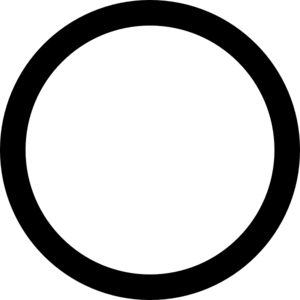 This symbol, in my opinion, better exemplifies the God I seek to know and follow after. Sorry to get on my soap box about the cross. Obviously it is important too. I just don’t think it’s the point, and I think logos ought to be about the point. That’s it for now. On to some game notes. Peralta was lights out. and only gave up 1 run and struck out 9. The Giants loaded the bases in the first but failed to score, and he pretty much cruised from then on. Peavy didn’t really have it over 5.2 innings, and he was fortunate to only give up 3 runs on 9 hits. Milwaukee got their first three batters on to start the game and it looked like they were going to pile on the runs, but instead Carlos Gomez was caught stealing and Pence made a terrific catch on the warning track to keep the Brewers to a 1-0 lead. Bottom of the 5th, Peavy made it to first* on a dropped third strike, and eventually came around to score on a Pence single to make it 1-1. * – Here’s a fun quiz: How many different ways are there to get to first base? The wheels came off for Peavy the next inning though. To lead off the 6th, Aramis Ramirez doubled, then Khris Davis did too, and a Rickie Weeks single made it 3-1. The Brewers bullpen – Jeffress, Smith and Rodriguez – would do the rest to seal the win for the Crew. Twenty-two down. Eight to go.